Siddesh is the second child of Mahesh, a temple priest. Siddu has thrived and grew into a curious little toddler. He was a typical young and healthy boy till April 2016. 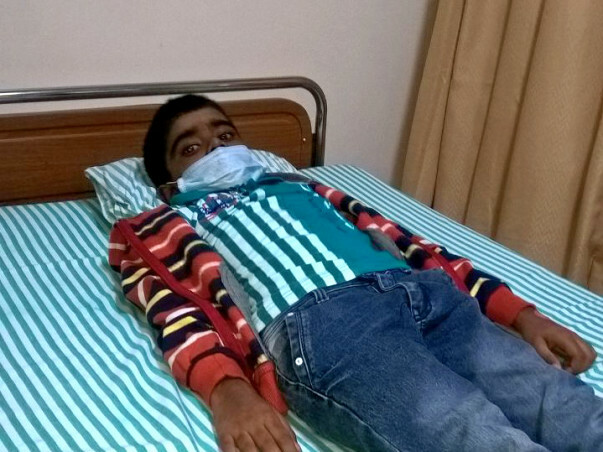 Because of repeated fever and blood coming from the nose, he was hospitalized in Mysore. The doctors referred him to Narayana Hrudayalaya Hospital, Bangalore. Siddu was detected with Aplastic Anaemia. A blood disorder where the bone-marrow does not produce blood cells. There wasn’t much improvement in his condition after the medical treatment that he underwent. Now the only method of saving Siddu from this distressful condition is to do a bone-marrow transplant, which would cost Rs 25,00,000/-. 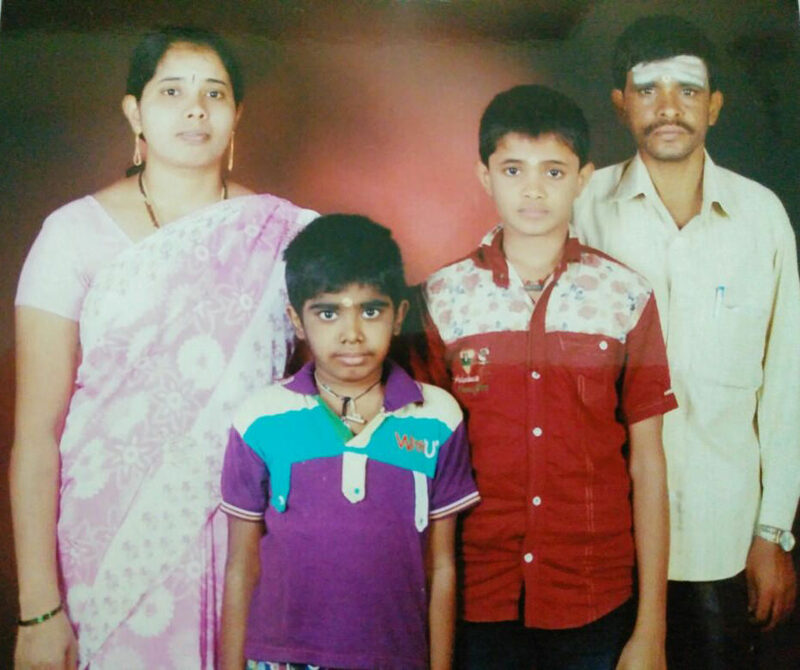 The family had spent around Rs 4 lakhs for his treatment with the help of their relatives and neighbours. Both his parents' and his elder brother’s bone-marrow doesn’t match. His grandfather is a heart patient and his father is a kidney patient; the family spends Rs 7,000/- for medical expenses every month. Like any other child, Siddu wants to go back to school, make friends and even play with others. He wishes to lead a normal life. Each one of your contributions can make much difference in his life. Let us give a new life to this butterfly. We really apologize to state that it was an error from our side in regards to the date of discharge of Siddesh. It is 29th November 2016 and not 2017. Sorry for the miscommunication. Thank you once again. I am Debotri, a fellow at Milaap. Here is an update on Siddesh's treatment. I spoke to Siddesh's mother this morning. "My Siddu is getting better by each passing day. It gives me goosebumps whenever I recall those days. He was hospitalised for almost 3 months and my child underwent a lot of trouble during those days. Things have improved after he was discharged on 29th November 2016. And this was only possible because of the donors to came forward to make this happen. I will be indebted to you throughout", she said. His RBC and WBC count have increased over time. The medication is providing longer immunity against the life-threatening disease. Also, Siddesh's parents are planning to send him to school from June. 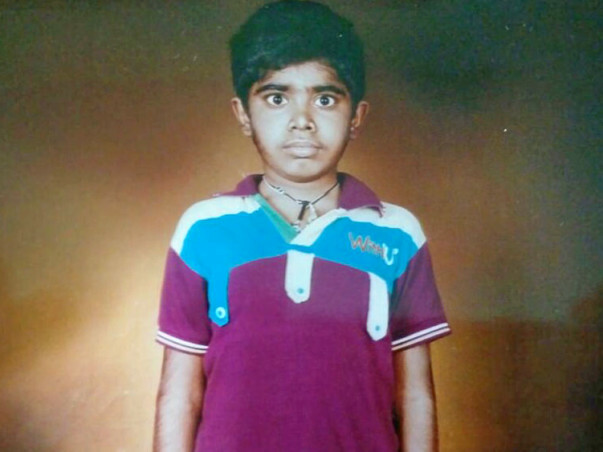 Currently, Siddesh and his mother are staying at a very small rented place near Narayana Hrudralaya, Bangalore. 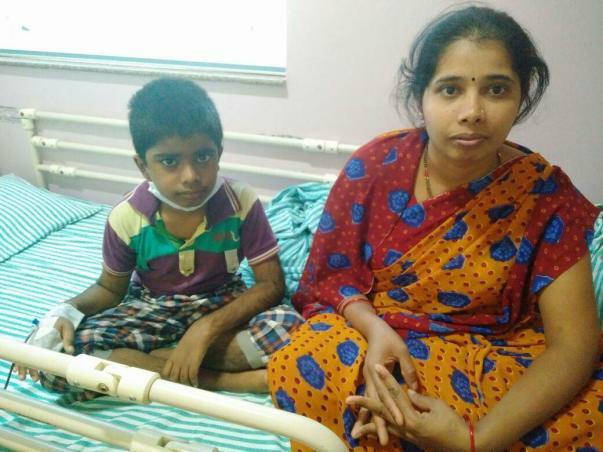 However, his father is struggling hard to bear the post-operative expenses of Siddesh. It would be really appreciable if you could share his story and help him to fight the battle. Thank you, donors, for your support and contribution. We will keep you posted on his progress. Siddu is currently undergoing his pre-BMT tests. 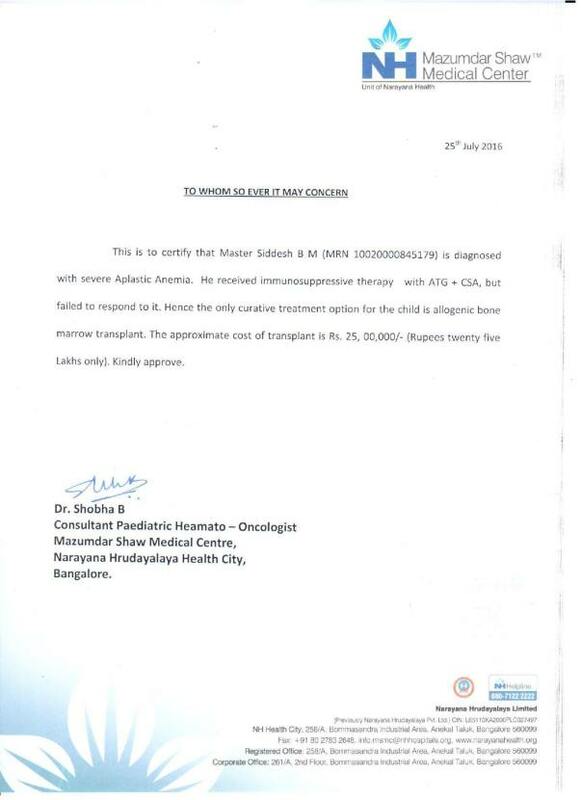 He shall be shifted to the Bone Marrow Transplantation unit in two weeks time. We shall keep you updated about the progress in his treatment. Requesting all your blessings and prayers for the success of the proceedure. 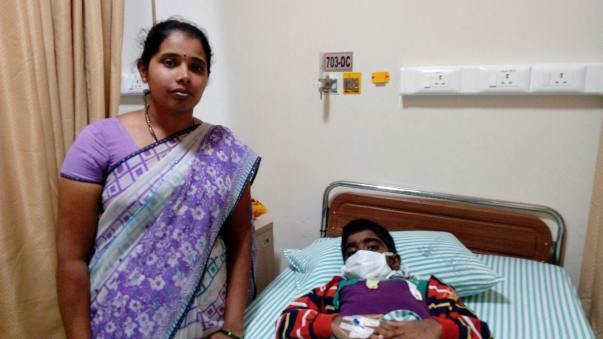 I hope and pray for the young boy Mahesh from Baby town in Karnataka to recover fully.